Do you or someone you love have a sweet tooth? Then our Fruity Wine Club is perfect! 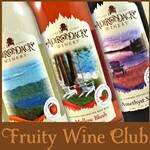 Four times per year, you receive three bottles of Adirondack Winery's signature fruit-infused or semi-sweet wines!